Do you remember all the stories that were prompted by solar flares back in the 70s? They were excellent, it was like the universe was sending us an amazing signal and it had the potential to change everything. Our watches would stop, our electricity would disappear and the world as we knew it would cease to be. We would have a violence free apocalyptic moment and it would come out of the sky. The visuals were spectacular, great orange geysers of gas exploding out from the sun. Giant oceans were boiling in the sky and sending spouts of change into our world. Nature was giving us a light show we would never forget. We quickly followed her lead and created stories great and not so great about life with flares. “Where Have All The People Gone”, released in 1974 told a dark and eerie tale of the disappearance of most of the Earth’s inhabitants as a result of those mysterious flares. From “Ringworld” to “Star Wars” we saw science fiction re-establish itself as a leading genre. The flares sparked our imagination. One of my favorite movies about flares wasn’t actually made until 2000 and it’s called, “Frequency”. The film has a father and son talking to each other through time on an old radio because of the flares. I won’t get into the story, but it was fun. Mystery, magic, murder and mayhem, doesn’t get much better than that if you’re into science fiction. So why am I telling you about flares? I was having a bit of a flare up myself reading some astoundingly irresponsible headlines that were reassuring the public that climate change was all a big misunderstanding and the Earth was actually cooling, when I decided I needed to do something to put myself in a better mood and went in search of science stories. I came across a treasure chest of hysterical flare stories that were centred around a prediction that some time in September 2013 we could see catastrophic destruction on Earth because of solar flares. There were YouTube videos and articles about how flares were going to destroy satellite dishes and cause huge amounts of damage as they took out essential communications, potentially cutting off whole communities. The American government was quietly ordering food to put in storage…I could go on. I started laughing, it was like getting a chance to go back to childhood and see the solar stories from an adult’s perspective. 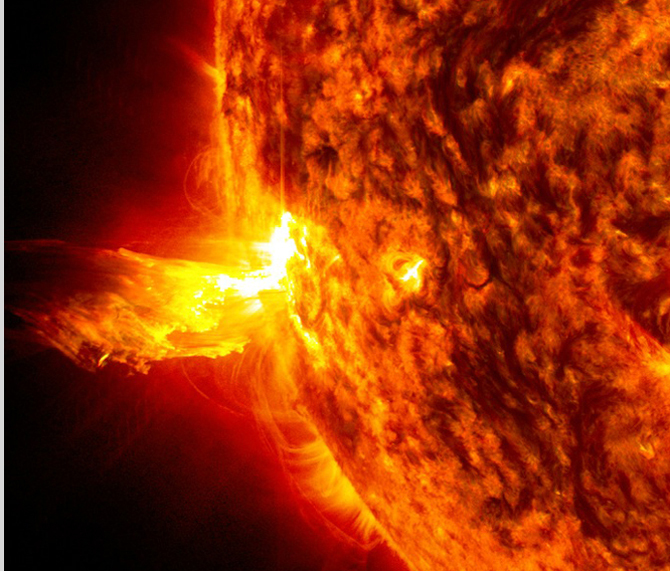 I looked at NASA’s recent solar flare images and was enthralled with flares all over again. We live in an amazing world. It’s easy to get distracted and forget to take a look around and appreciate all the wonder, even the silly stories. What about you? What does mother nature do that leaves you spellbound or captures your imagination? Last year (well, almost 2 years ago now) when the talk was about the apocalypse and the Mayan calendar coming to an end, I have to admit, I was fascinated with the subject and what it could mean. I came to the conclusion that there probably were going to be big… enormous changes in our world but that the end of this world was not happening and that kind of thinking should be squashed. There have been large changes going on that have been brought about by mother nature. Look at those tropical storms/cyclones that have hit Indonesia and Japan. It was just last week that there were floods in the mountains and on the eastern plains of Colorado. The changes in nature are becoming more pronounced and I do believe it’s going to continue for a while. I got into the Mayan calendar predictions as well, nothing like universal forces moving in mysterious ways to capture the imagination. I think the weather conditions over the last few years have been pretty crazy, and like you I think we should get used to them. I also believe that if we have a lull in those conditions, it doesn’t mean everything is back to normal. That’s a freaky looking picture. I bet my son would love it. He loves anything to do with space. Isn’t it cool? What gets me is that it isn’t some image out of an artist’s imagination. I am a little boring in that all it takes for me is a spectacular sunset. I am fascinated by the universe, love looking at stars and have wow factors often when I stop in time and really look at something. Annie Dillard’s essay “Total Eclipse” touches on all the build-up surround such an event, and how unmoved people seem once the event actually happens: “We were born and bored at a stroke.” Lots of people experience difficulty situating themselves in the larger context of climate change. One of my favorite nature-type things to do is observing the way sunlight filters through leaves. I make an effort to do so regularly. It always makes a bad day better. What a great phrase, “We were born and bored at a stroke.” It certainly seems to capture our collective attention spans. One of my lasting regrets is that I did not buy a painting from an artist who could beautifully capture the effect of sunlight through trees as you look up into the canopy. That’s a great choice. When I was in the Marines there was a time on ship when the universe gave me an amazing show. When you are out in the middle of the ocean with no lights around you can see so much more of the night sky. I saw so many shooting stars that night. I have seen nothing like it since. I am so with you sister. Does anyone ever talk to the farmers? I had a conversation with a few old-time vintners and they tell me there has been a totally shift of a month on each end of the growing season. They believe it’s permanent…. That is scary. Susan, I was so mad after reading those silly articles I started to rant, almost did a big cranky post about it but got a handle on myself. Only my family needs to put up with cranky Debra in the morning. I have to think that most people have enough sense to know that you can’t believe everything you read. Go out of the city on a clear night of no clouds. Look up into the sky. The look of the stars is amazing they are so bright and so many. Another of many things that mother nature does to astound me is the vibrancy of colours after it has rained. I love doing that Eleanor. Staring up at the stars on a warm summer night in the country is mesmerizing. Couldn’t agree more on the vibrancy of colours after the rain. I like taking pictures of my garden after it rains, everything is so much richer.